I knew it was coming, like you know when a tea kettle’s about to start shrieking. My breath caught in my chest and I could feel my blood pressure rising. We were seconds away from a total meltdown, and I was bracing for the inevitable… the screaming, the kicking, the scene, the clucking of disapproving bystanders while I felt my way through the challenge of dealing with toddler tantrums… especially in public. Everyone talks about the “Terrible Twos” and it’s temper tantrums that gives that phase in parenting a bad rap. Are tantrums truly inevitable? Are there better ways to handle them? To help your child get through them and keep your relationship and sanity intact? Here’s a quick guide to walk you through what’s really happening, how you can help, and what to expect. Temper tantrums are random bouts of extreme anger. They’re different than just normal attempts to get attention. Often, during a tantrum children will scream, cry and thrash around all over the place, shouting and kicking and stomping their feet. Tantrums are initially intense, and tend to last for about one to three minutes. 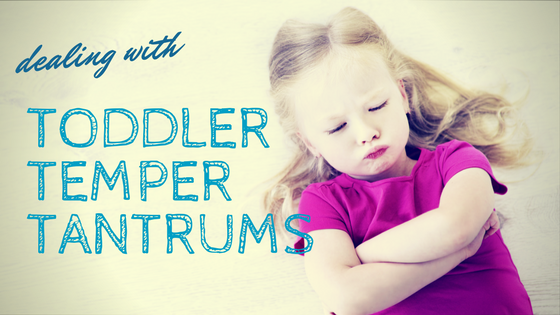 Handling a toddler’s temper tantrums is aggravating. Luckily, dealing with them is not impossible. Sometimes a tantrum will last a bit longer than less severe fits. The kid may even result to biting, slapping, pinching, and other forms of aggression. Often, violent tantrums can be a sign of a deeper, more serious issue when the child hurts themselves or others. Usually temper tantrums are displayed by kids anywhere from ages 1-4. Yet, a tantrum can come from anyone at any age. It’s fairly common for a child to have the occasional tantrum, most kids experience these at one point or another. Children ages 1-4 tend to throw more tantrums than older children. Some toddlers may even throw tantrums on the daily. Why do kids throw temper tantrums? Temper tantrums tend to be an immediate response to the child feeling they are being preventing them from gaining more freedom or attempting to learn a skill. Toddlers aren’t usually able to express their feelings in a collected manner, perhaps due to a limited vocabulary. For example, a kid might throw a fit when their mom reminds them of their bedtime if they’d prefer to stay up longer, or if they’re struggling to tie their shoelaces for the first time and get frustrated. The severity of the temper tantrum varies from kid to kid for a few reasons. Common factors of a melt-down to consider are how old the kid is, how tired they are, the child’s stress level, and any mental, physical, or emotional issues. The way a parent responds to a tempter tantrum is a major factor as well. When a parent is too harsh when handling a child’s inappropriate behavior or gives in so the fit will end, the child is more likely to throw more tantrums in the future. How Do I Deal with Toddler Tantrums? The best way to handle a tantrum is to ignore it. This causes the child to learn to better control their feelings. It’s really important to notice what causes a child’s temper tantrums. If you can recognize what can trigger a tantrum, you’re more prepared to take action in order to prevent the toddler from having a total melt-down. Once the child is about 2 years old, you can think about using a system for time-out. Sending the kid to time-out helps them to simmer down and get a better handle on their emotions all the while still indicating that bad behavior is not tolerated. This system only really works if the kid understands why it is effective. Will My Toddler Outgrow Tantrums? As children get older they discover better and new ways to deal with their anger and frustration instead of throwing a tantrum. Kids around ages 6 and up who are still exhibiting temper tantrums might need additional help learning to handle their feelings. This might also be a sign of alternate problems, such as a learning disability or difficulty getting along with kids their age. But as soon as you are able to detect tantrum triggers, it’s a million times easier dealing with toddler tantrums. Find out more about dealing with toddler tantrums and get more helpful tips here. PreviousDo I Have Kidney Stones?